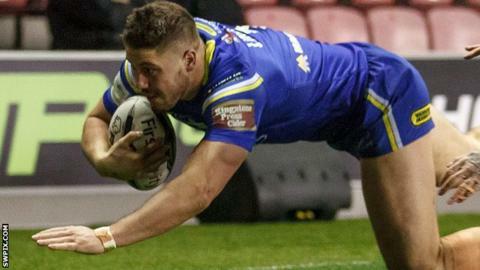 Warrington's first-half blitz laid the platform for a convincing win against Wigan Warriors, and keeps them top of the Super League table. The Wire were up 22-4 at the break thanks to tries from Ben Currie, Tom Lineham, Kevin Penny and Stefan Ratchford, with Dom Manfredi replying. Free-scoring winger Manfredi completed his hat-trick with a second-half double as Wigan improved after the break. However, the visitors scored again through Ryan Atkins to seal the points. Wigan were unbeaten in 21 months on home turf in Super League before last month's defeat by Widnes, but have now lost twice this term and trail Warrington by two points. Shaun Wane's side gave a debut to Jack Higginson amid their injury concerns, and saw influential captain Sean O'Loughlin limp off at half-time with a hamstring problem. Meanwhile, Warrington gave a fine performance to cement their early title ambitions, and win their first game in five at the DW. Atkins' score was his fourth in as many games, but Warrington also lost two key personnel in Chris Sandow to a hamstring issue of his own and Rhys Evans with a shoulder problem. "I couldn't care less if Wigan were going to win it, I was worried about my players. It was tough, we couldn't rotate them after losing those two players in the first half. "We had a number of players who shouldn't have been on there after a while with some of the knocks they took. "I saw the determination of the players - they weren't going to let it slip. Their defence was enormous tonight." "We didn't start well, we were a little bit soft in that early period, but overall I am very proud of the effort. "With the players we have out and the situation we are in it was a really good effort against a strong Warrington team. They were the best team and deserved to win. "I thought we could have sneaked it, there were a couple of periods in the second half when there were some poor decisions from the officials where they missed things - and it put us under pressure." Wigan Warriors: Sarginson; Manfredi, Higginson, Gildart, Charnley; O'Loughlin, Smith, Mossop, Powell, Clubb, J. Tomkins, Farrell, Burke. Replacements: Tautai, Sutton, Isa, Gregson. Warrington: Russell; Penny, R. Evans, Atkins, Lineham; Gidley, Sandow; Hill, Clark, Sims, Currie, Hughes, Westwood. Replacements: Ratchford, Westerman, G. King, Cox.